Many are familiar with the Book of Baruch in the Apocrypha but few are acquainted with the apocalyptical writings of Baruch which are far more far-reaching in their scope. Several variations of the Book of Baruch have come down to us but this volume known as the Syriac Apocalypse of Baruch is so called because it is only extant in a Syriac translation. The Apocalypse of Baruch is written in the first person as Baruch recounts what befell him immediately before and after the destruction of Jerusalem. The internal evidence identifying the time and place of the historical setting of this work coupled with the remarkable prophetic portions of it warrant a thoughtful reading of the latter as a guide to understanding in these days in which we now live. While some scholars claim there may be interpolations in the main this Apocalypse of Baruch remarkably demonstrates its inspiration in the light of the present rapidly developing world crisis. The first publication of this translation from the Syriac was made in 1896 A.D. by R. H. Charles M.A. Trinity College Dublin Ireland and Exeter College Oxford England. 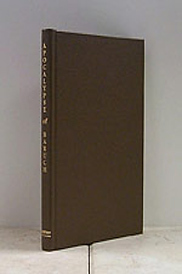 The Preface and Introduction to the original publication clearly reflect the influence of the Higher Critic in making an analysis of the writings of Baruch. The same overall approach is apparent in many of the footnotes published along with the text. However we are including the footnotes in this printing with a word of caution that they should be read with this explanation in mind. The reader must allow the text itself to influence his rejection or acceptance of the authenticity of what is written. There is an essential fact to be taken into consideration in studying the prophecies of Baruch. It was not until after World Wars I and II that the visions he recorded began to be clarified for then the events to which Baruch referred began to develop and come to fruition. Dr. Charles and the Higher Critics of his time naturally could not for see this; hence their scepticism and refusal to accept at face value the inspired statements in the translation of Baruch's apocalyptical writings. This book has long been out of print but our evaluation of its worth based upon well-founded evidence of Divine inspiration convinced us that its republication is mandatory at this time. It is now made available for the information of the wise and prudent.